These are two towns on opposite sides of the Neisse river. Before the river was set as the border in 1945, they were the same town, and they’re now effectively twin cities. You can walk across a foot bridge between them. I remembered all of this from an earlier version of the Rick Steves guidebook on Germany, but it isn’t in the current edition. Still, I remembered that it was supposed to be a picturesque little town. Parts of the German side are, but not any more than you would see elsewhere in Germany. The Polish side probably has a center of town somewhere, but I certainly wasn’t able to find it. The tourist map they give out in Görlitz cuts off most of Zgorzelec. 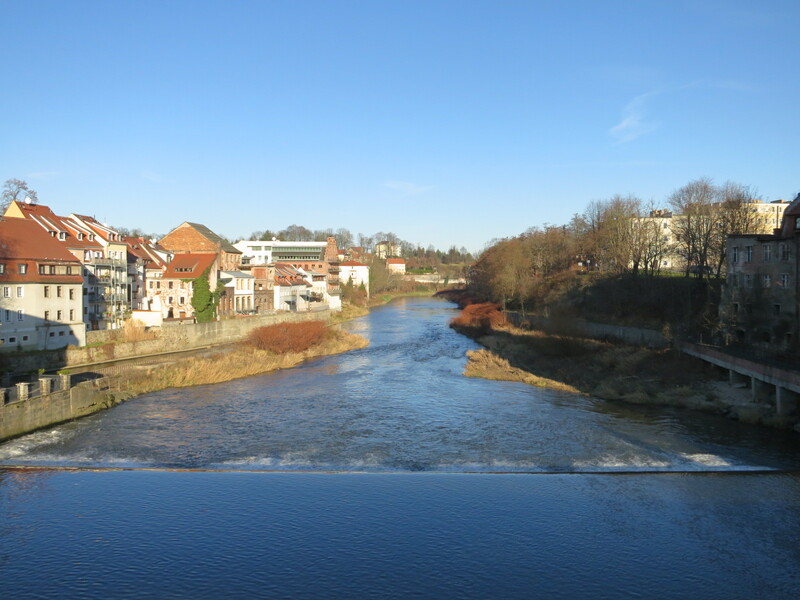 To make matters worse, I was on my way from Berlin to Prague, so I had all my luggage with me, and there’s a steep hill down to the river, and a steep hill up the other side. Google Maps drained my battery again, so I couldn’t use that, which left me just picking a likely-looking direction. 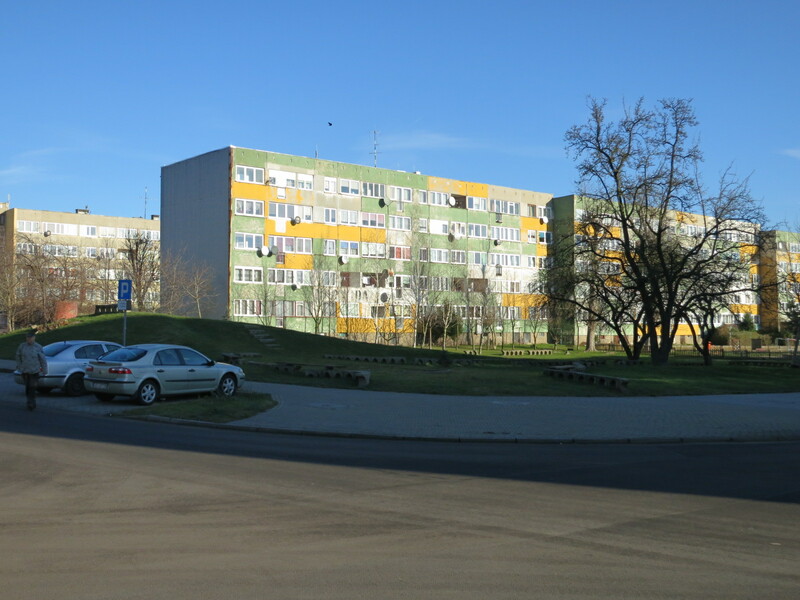 All I found was a residential area with Soviet architecture. I made a big loop and walked back to the bridge. Back on the German side of the bridge, I stopped to look at the map and collect my thoughts before trudging back up the hill with my luggage. 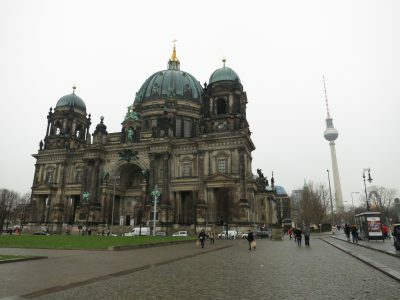 As I started to cross the street, I was approached (in fact, surrounded) by three polizei who wanted to see my passport. As I started to hand it over, I remembered that I had tucked some Swiss and Danish currency in it, so I quickly pulled that out, lest he think I was trying to bribe him with roughly $15 worth of foreign currency. Poland and Germany are both in the Schengen area, so crossing that border shouldn’t require a passport, but I guess someone crossing on foot with a lot of luggage might look a little suspicious. Fortunately, he saw my entry stamp from Copenhagen and concluded that I was legal. 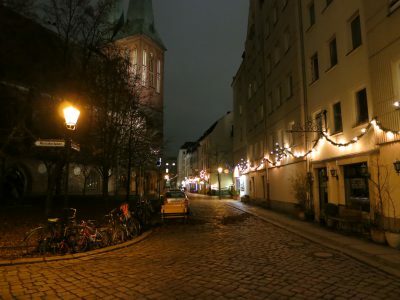 Having thus made it past the polizei, I trudged up the hill to the center of town. My phone battery was dead, but I knew I would need it to contact the Airbnb people once I got to Prague, so I found a place with a plug and bought pastries and cappuccinos until my phone was about 2/3 charged. I would have stayed longer, but the plug was right by the door, so I was partially blocking the entrance by standing there. The train trip from Görlitz to Prague was uneventful. For the final leg from Dresden, I had a first-class ticket and had a nice dinner in the dining car shortly before arriving. 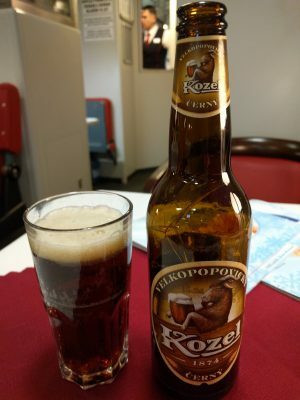 This included a Czech beer that is seemingly popular with goats. 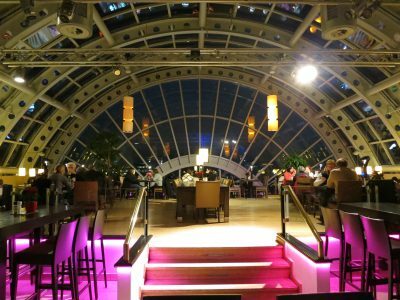 When I arrived in Prague, in a freakish twist of fate, everything went smoothly. I found an ATM and withdrew 3000 koruna, bought a three-day tram ticket from a machine, figured out the location of the tram stop right away, and got to the stop just as my tram was arriving. I got to the Airbnb apartment in about 15 minutes, and the owner showed up a few minutes later to let me in. Not wanting to press my luck further, I think I’ll turn in for the night. This entry was posted in Travel and tagged czechia, germany, passport control, poland, prague, train on December 13, 2017 by mdw. 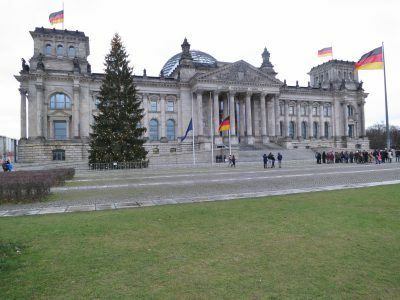 After the Reichstag, I came back to the hotel and lounged around for a while. 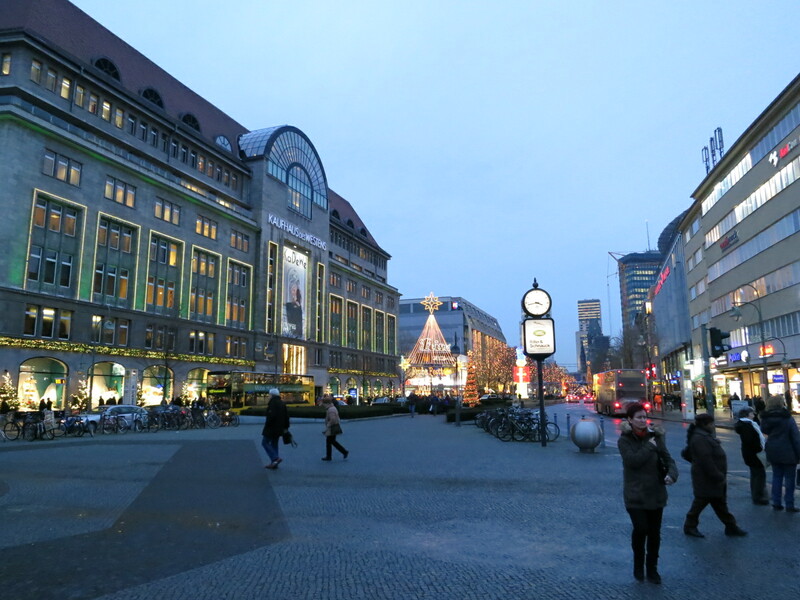 I didn’t really plan to go anywhere except KaDeWe in the late afternoon, but I got tired of lounging, so I went to Potsdamer Platz, which is on the way to KaDeWe. 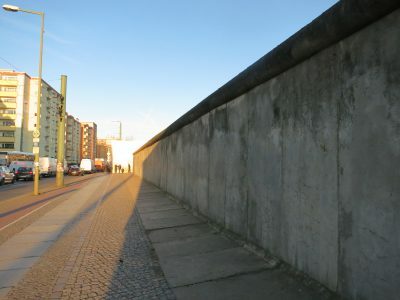 Potsdamer Platz was right on the junction of the American, British, and Russian sectors, so the Wall ran right through it. There were some apartments and businesses overlooking the Wall (such as the studio where David Bowie and Iggy Pop recorded), but much of the area had been destroyed in the war and not rebuilt, or cleared away to form the no-man’s land between east and west. Most of what’s there now is less than 20 years old. 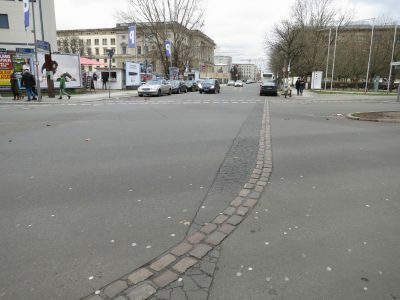 The location of the Wall is marked by a double row of bricks in the pavement. I didn’t realize this until I got there, but down a side street is the last remaining BT 6 Watchtower of the DDR, just standing there on the sidewalk. 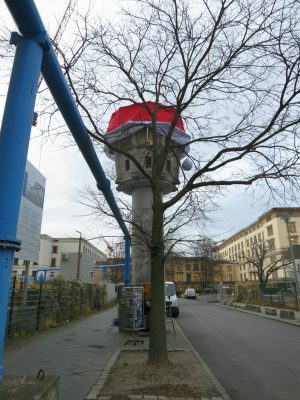 And this being December, it has a Santa hat. The tower is a city monument, but it doesn’t receive any money. It’s run entirely by volunteers. 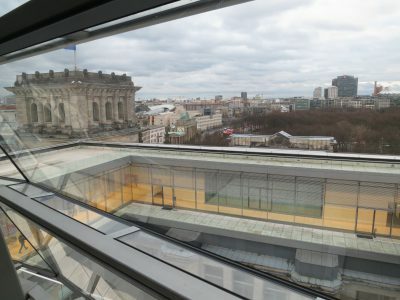 Today it was staffed by a friendly woman named Susi who had worked in the Potsdamer Platz area in the mid-’80s and could see this tower from where she worked. I climbed up in and looked around. Visibility is good, but there’s not a lot of space up there. After the tower, I took the train to Wittenbergplatz and walked down Tauentzienstraße until I got too cold. By then it was time for an early dinner at the Wintergarten buffet on the top floor of KaDeWe. This is the most spectacular buffet I’ve ever seen. 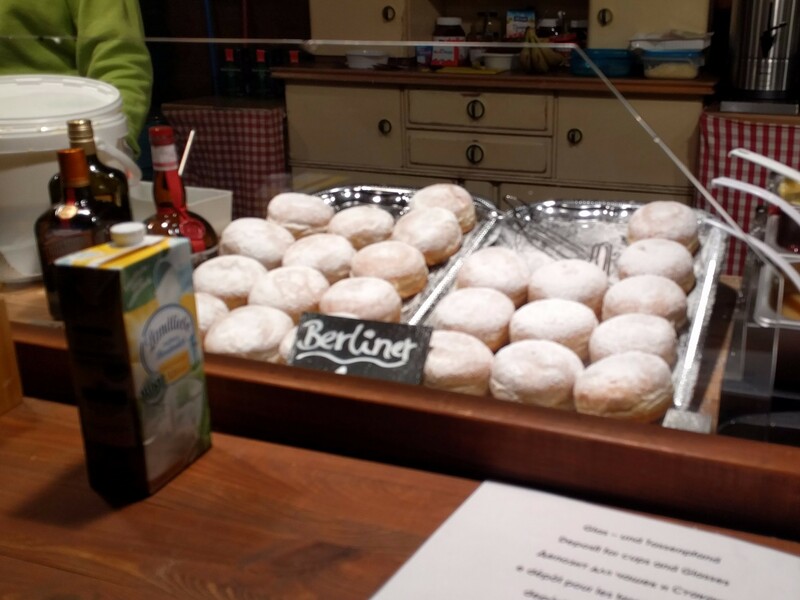 I recommend the Apfelstrudel. Now I need to pack. My train leaves Berlin tomorrow at 0630. 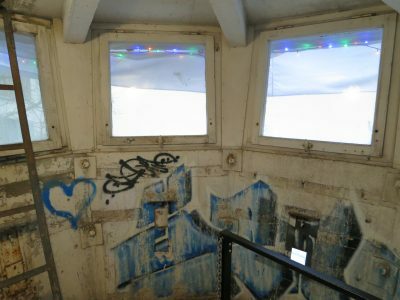 This entry was posted in Travel and tagged B-Turm, berlin, berlin wall, germany on December 12, 2017 by mdw. 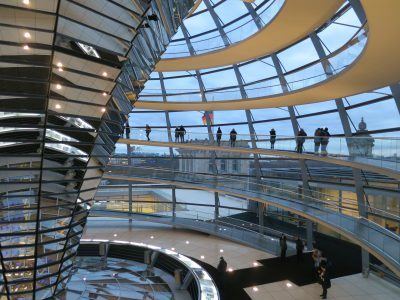 This morning I visited the Reichstag building at 8:00 AM. It’s free, but you have to make an appointment, and the only remaining choices while I was here were early morning and late night. The appointment was just for the dome, which was added in 1999. 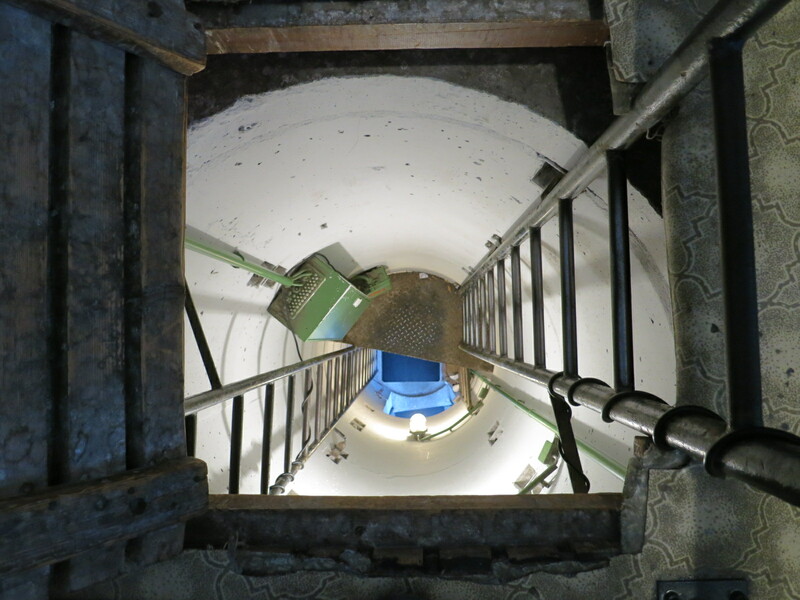 You get a recorded audio guide in your preferred language and wind your way slowly to the top, then back down again. 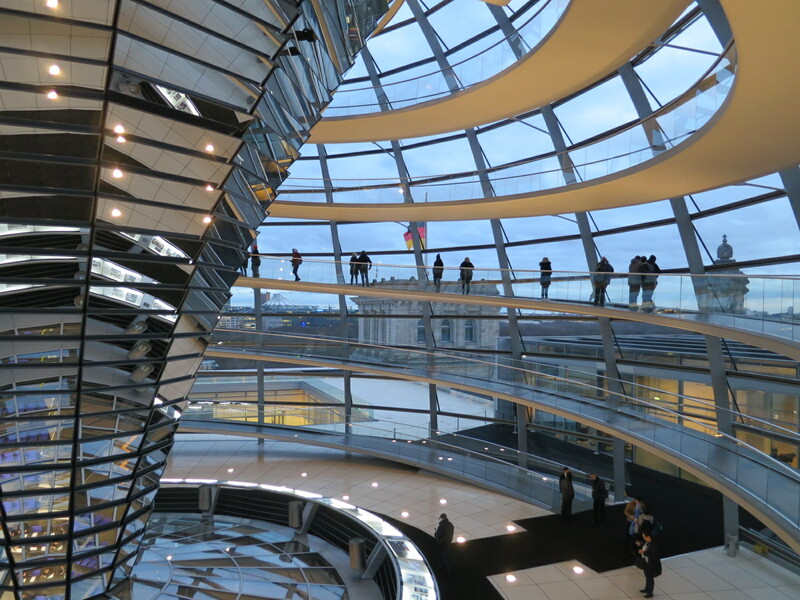 It’s open at the top and bottom for air circulation, and the mirrors adjust to provide natural light to the parliamentary chambers below. I had forgotten that Christo wrapped the building in 1995. Fun fact: The original building was ruined in World War 2, and the inside was gutted and rebuilt in the 1960s. 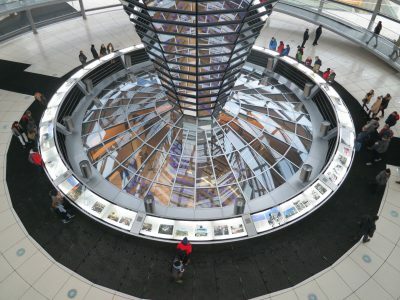 Then it was gutted and rebuilt again after reunification. Only the outer walls are original. The insides look like an ordinary office building. 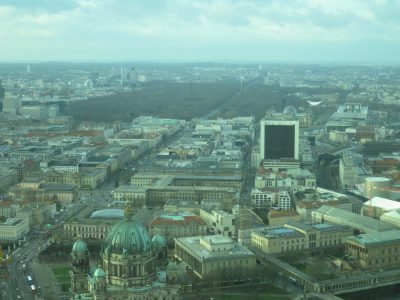 This entry was posted in Travel and tagged berlin, germany on December 12, 2017 by mdw. My foot and knee are still bothering me, and probably won’t recover until I stay off them for a while. So naturally today I walked almost eleven miles. In the morning I went across the river to the East Side Gallery, which is a mile-long section of the Wall that was given over to artwork in 1990 and restored in 2009. 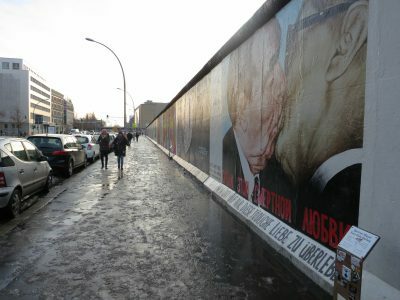 A lot of it is overtly political, not surprisingly, like this famous picture of Brezhnev and Honecker kissing, which until this trip I did not realize was based on photo and actual practice of communist heads of state. Hard to imagine kissing Brezhnev. That’s the stuff of nightmares, that is. Not that Honecker would be a delight, but Brezhnev is somehow worse. Some of the pieces are more fanciful. 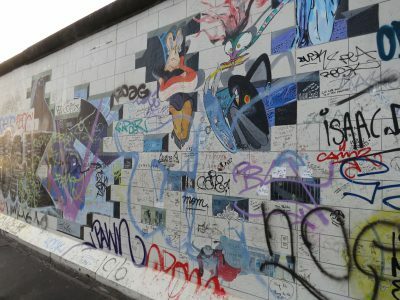 There are signs threatening prosecution for defacing the murals, but a lot of them have graffiti anyway, like this Pink Floyd piece. Of course the best is this one. Somewhere there’s a companion piece showing the other side, but I don’t know where it is. 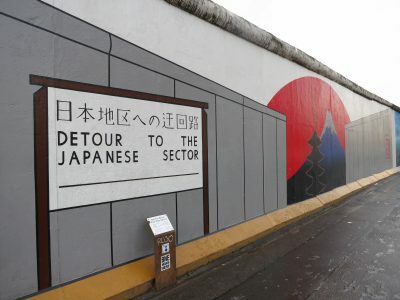 There are bits of the Wall all over the place. 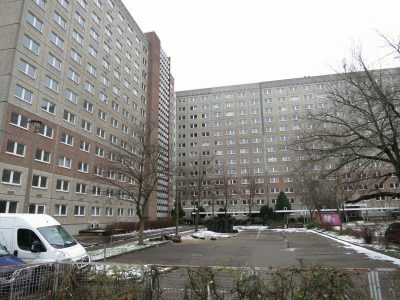 From there it was only a short hop on the U-Bahn to the Stasi museum, inside the old Stasi headquarters. There was a film crew there, so I wasn’t able to see Erich Mielke’s office, but I did snoop in some of the lesser offices when the film people weren’t paying attention. At its peak, the Stasi complex covered 54 acres, with 50 office buildings. From there I took the train to the Checkpoint Charlie area. 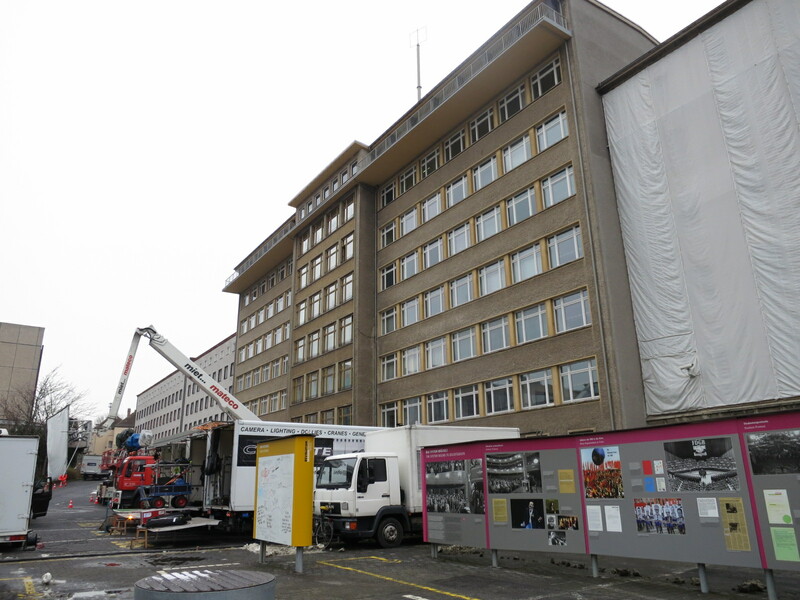 Of course it’s not the real Checkpoint Charlie, because that’s long gone, but everyone’s heard of Checkpoint Charlie and expects to see it, so they have a fake one. There’s also a Checkpoint Charlie museum and a film experience and a whole lot of souvenir shops all selling the same souvenirs. I bought a shirt. 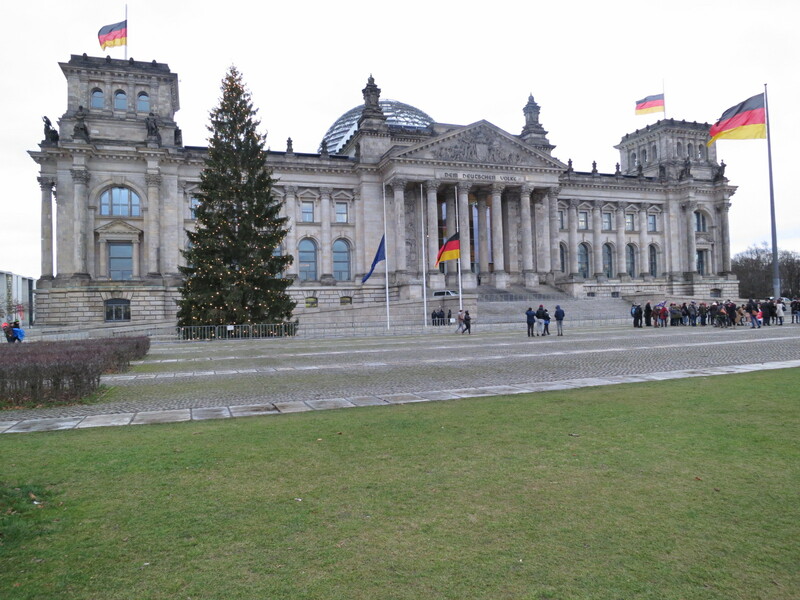 Then I walked over to Unter den Linden and bought another shirt. 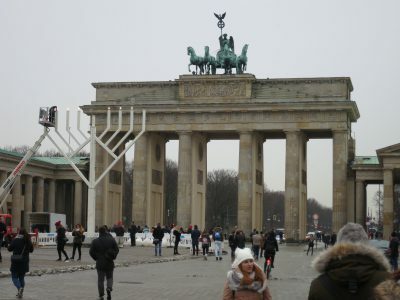 Then I walked to the Brandenburg Gate, where someone was assembling a giant menorah. Then I walked up Unter den Linden. Initially I was identifying things in the guidebook as I went, but it was getting colder and I started walking faster and I left my guidebook, and my hands, in my pockets most of the time, so I don’t know what everything was along the way. In all of the tourist areas, there are guys selling genuine East German and Soviet hats and pins and flags. Absolutely for-sure real stuff. Some of the stores are even still selling pieces of the Wall. And in case you doubt them, they come with a certificate of authenticity. And certified authenticity is the most authentic authenticity. After a brief stop at the hotel, I took the train to Kaufhaus des Westens, aka KaDeWe, the largest department store in continental Europe. All of it is impressive, but the food market is amazing. It’s an entire floor of cafes, delis, bakeries, candy stores, grocery stores, wine bars, and any other food-related thing you can think of. It is to an ordinary food court what West Berlin was to East Berlin. I think I spent close to an hour just wandering around on that floor. After I left KaDeWe, I got on the train going in the wrong direction. Could happen to anyone, really. Eventually I made it back to Alexanderplatz and stopped in the Nikolaiviertel for a Feuerzangenbowle, as one does this time of year. 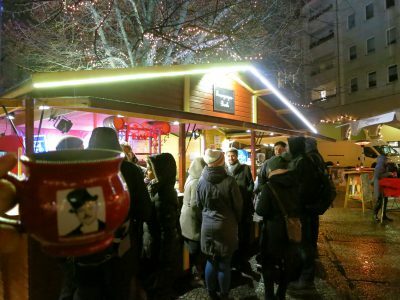 “Feuerzangenbowle,” it says here in Wikipedia, “is a traditional German alcoholic drink for which a rum-soaked sugarloaf is set on fire and drips into mulled wine. It is often part of a Christmas or New Year’s Eve tradition. The name translates literally to fire-tongs punch.” It’s a close relative to glühwein and thus to gløgg, but probably a bit stronger. 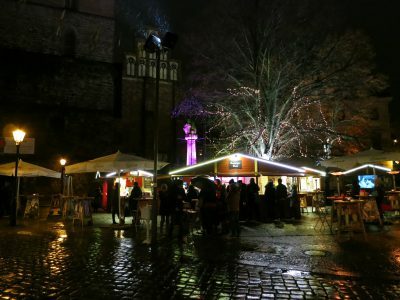 The venue selling this concoction was right next to the Nikolaikirche, a (mostly reconstructed) 13th-century church that is now a museum. They seem to be connected to it in some way. They sell this drink and a few others and have the 1944 movie Die Feuerzangenbowle running on a continuous loop. The Nikolaiviertel itself is supposedly the historical center of Berlin. The church is legitimate, even if it’s mostly a restoration, and some of the other buildings are authentic, too. They’re just not necessarily authentic from that particular location. And a lot of the others are idealized recreations. All of this was put together by the East German government for Berlin’s 750th anniversary in 1987. It’s sort of a Germanic Main Street USA. 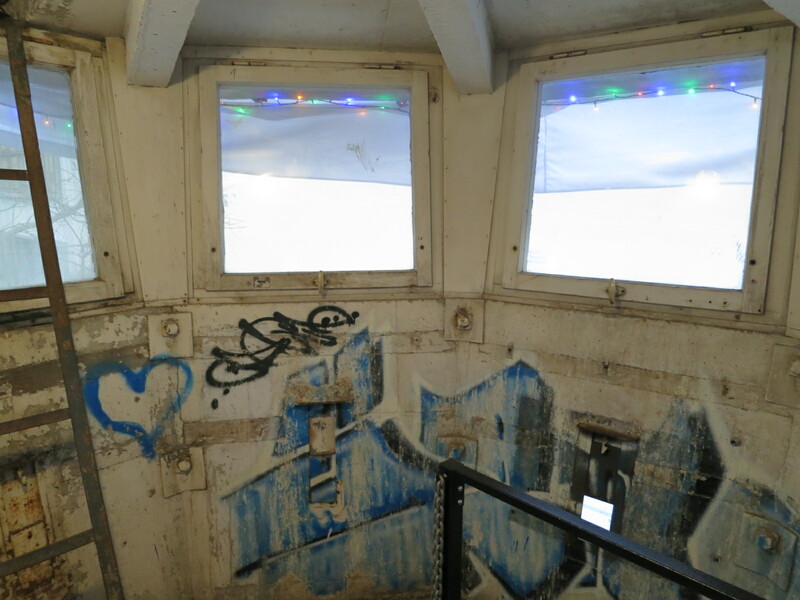 This entry was posted in Travel and tagged berlin, berlin wall, feuerzangenbowle, germany, gløgg, train on December 11, 2017 by mdw. This entry was posted in Travel and tagged berlin, germany on December 9, 2017 by mdw. I had a Berliner. President Kennedy was not involved. This entry was posted in Travel and tagged berlin, cuisine, germany on December 9, 2017 by mdw. I went up in the tower because you have to go up in the tower and you go to 668.57 feet and take pictures and so I did. But there’s no outside part so I had to take pictures through the window and it makes them sort of blue. The Trabant was not bad. 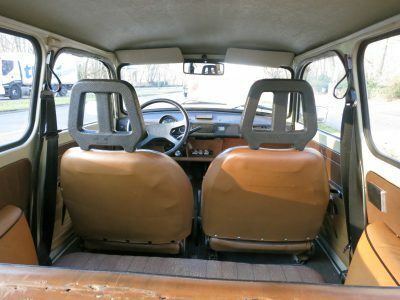 I rarely needed to go faster than about 40 kph, and the Trabi is highly maneuverable. 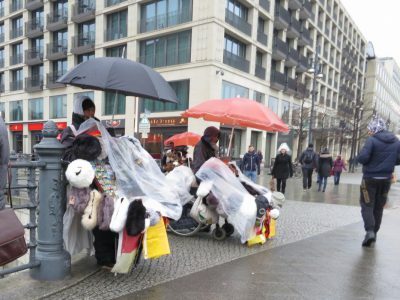 Berlin traffic is another matter. 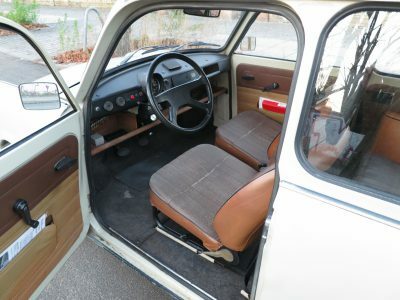 I paid extra to have the Trabi delivered to the hotel. The guy was a little late, and there was a very Cold War feel to waiting on the street in East Berlin to meet a man I didn’t know who was driving a Trabant. Although the Holiday Inn Express I’m staying in doesn’t quite fit the scenario. 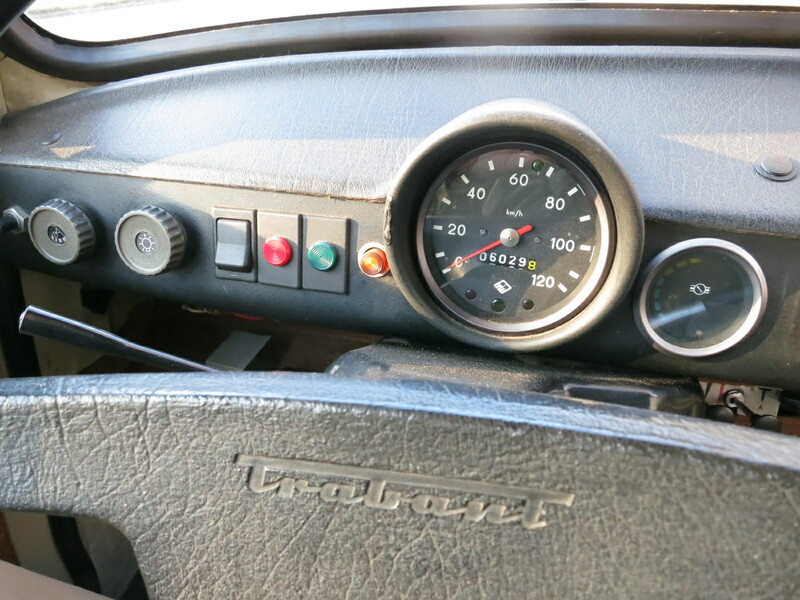 When he arrived, he gave me a brief rundown on how to drive the car, and we went for a short drive. Then he took the U-Bahn to wherever he was going next, and I took off in the Trabi. I found one of the two remaining portions of the Wall pretty easily — it was just across the river — but parking was impossible, so I kept going, heading toward Potsdamer Platz, with the vague goal of driving through the Tiergarten. 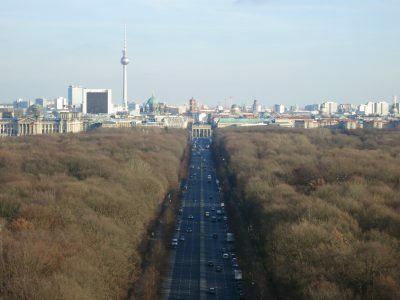 I drove through the heart of West Berlin, past KaDeWe and other high-end stores while impatient people in high-end Mercedes sedans passed me. After some trial and error, I made it into the Tiergarten and to the Victory Column at the center. Three euros to go to the top. 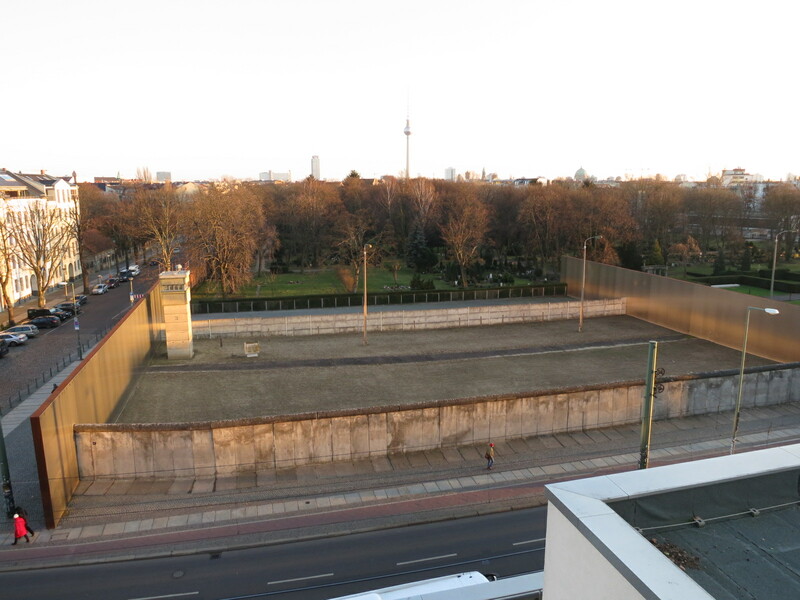 Then I used Google Maps to guide me to the Berlin Wall Memorial. It got me most of the way there, then inexplicably guided me in a loop through back streets several blocks away. I found the place easily once I turned off the mapping. The memorial is a park with a section of the wall complex as it existed in 1989, including a guard tower and the death strip between the inner and outer walls. There’s a museum across the street. Google Maps seems to drain the battery more quickly overseas than in the US. Three times this trip it’s died on me while I’m using it. The third time was shortly after I left the Wall. My only paper map was just a tourist map and not very detailed. Effectively, I had no map at all. 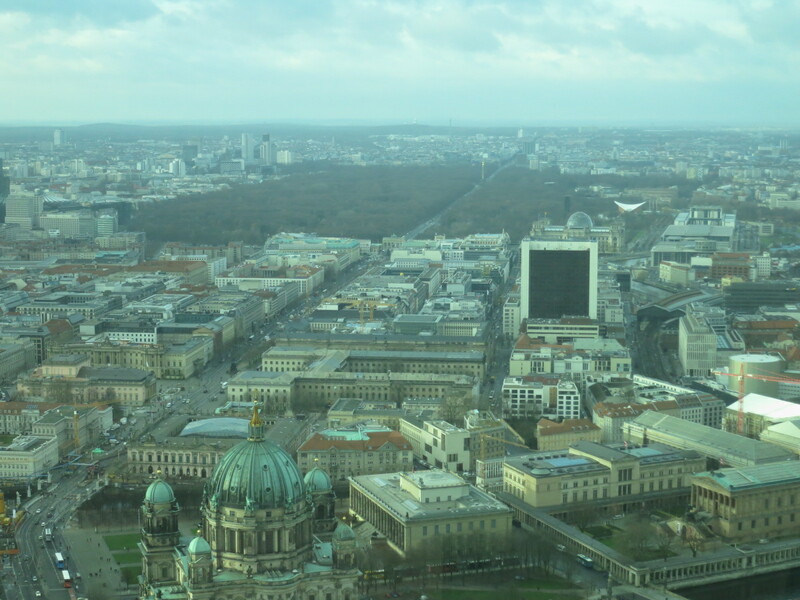 But I could see the Fernsehturm, even after dark, so I figured I could just guide myself by that. My plan was sheer elegance in its simplicity. This was at about 4:30, and I headed straight into commute traffic. Also, roughly 90% of Berlin streets are under construction for one reason or another. Often, I could see where I wanted to go, but I couldn’t get there because I couldn’t change lanes, or because construction was in the way. 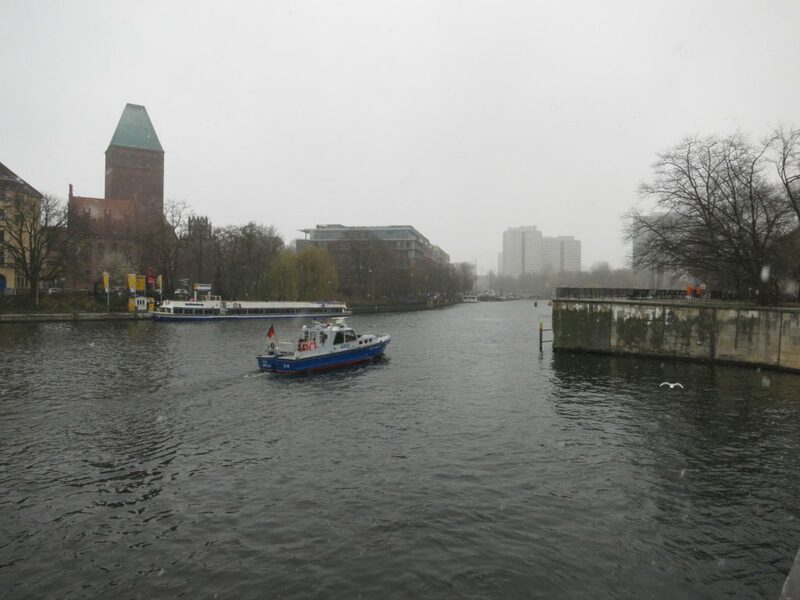 I looped around Alexanderplatz three times, at one point crossing the river and getting stuck in traffic that was going to an opera. I escaped by backing down an alley. I had to go back to the hotel, because that was the only place where I knew I could both park and charge my phone, which I needed to do so I could map where to return the car. I made it back to the hotel at about 6:00. It had taken me 90 minutes. If I had taken a more normal route, it would have been a ten-minute trip of a little over two miles. Berlin drivers are pretty aggressive, but mostly pretty good drivers. They remind me of Los Angeles drivers in that respect. Except for the taxi drivers. They drive like Italians. Through all of this I was a minor celebrity. Everywhere I went, people smiled, waved, and took pictures. I should look into getting one of my own. It seems like it’s kind of a babe magnet. 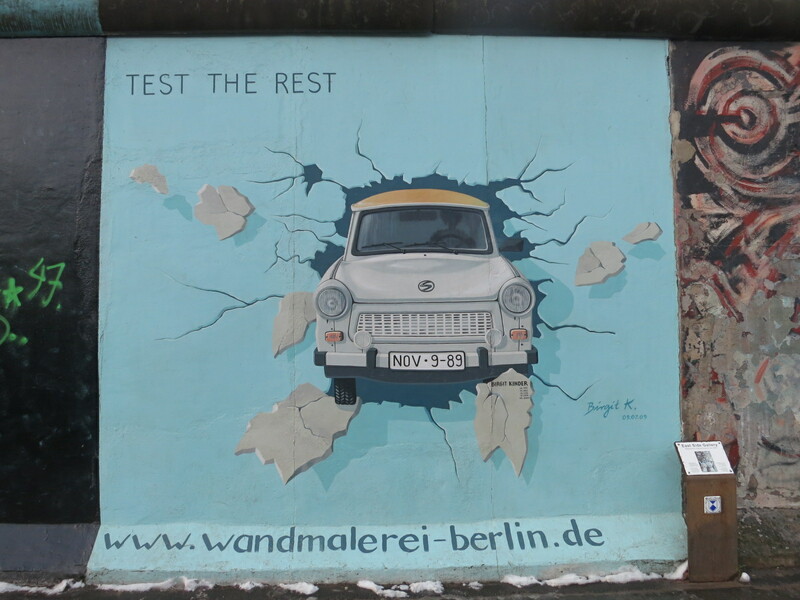 This entry was posted in Travel and tagged berlin, berlin wall, driving, germany, trabant on December 9, 2017 by mdw. This entry was posted in Travel and tagged berlin, berlin wall, germany, trabant on December 7, 2017 by mdw. 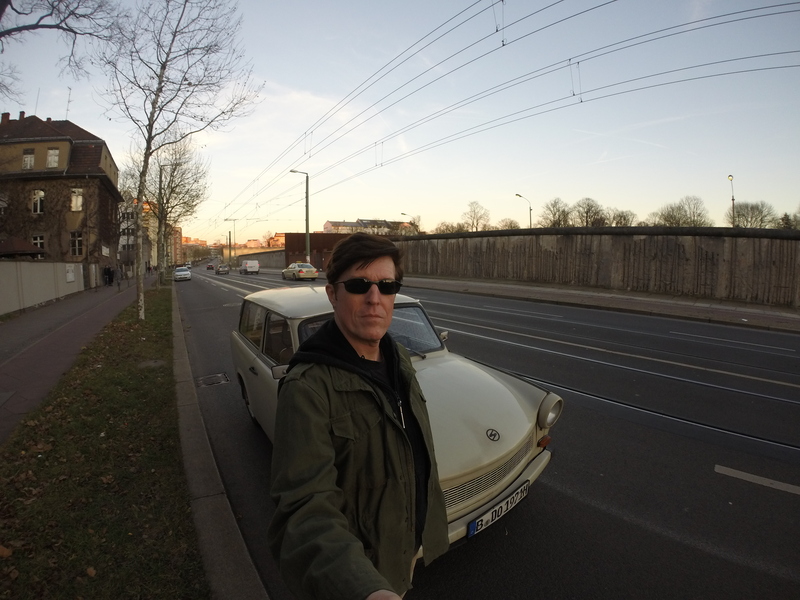 Yesterday I rented a Trabant station wagon and drove all the hell over Berlin. 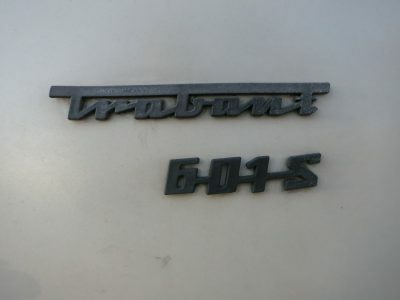 The Trabant was the one and only car produced by the DDR, with pretty much the same design from 1963 to 1990. It had a Duroplast body, a two-stroke engine, and a whopping 26 horsepower. I briefly had mine up to 60 kph (36 mph). I don’t think it would have gone much faster. You have to open the gas line before starting the car, and remember to close it again when you turn it off. If the engine is cold, you have to pull the choke. You can only lock the driver’s side door from the outside. You can only lock the passenger door from the inside. You honk the horn by pushing on the blinker lever. Column shift! 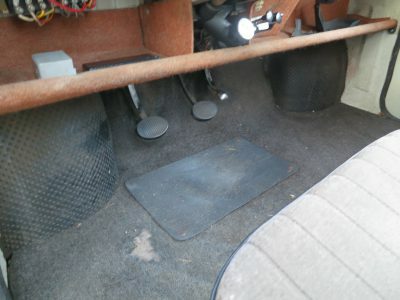 Just like my 1963 Plymouth Valiant. 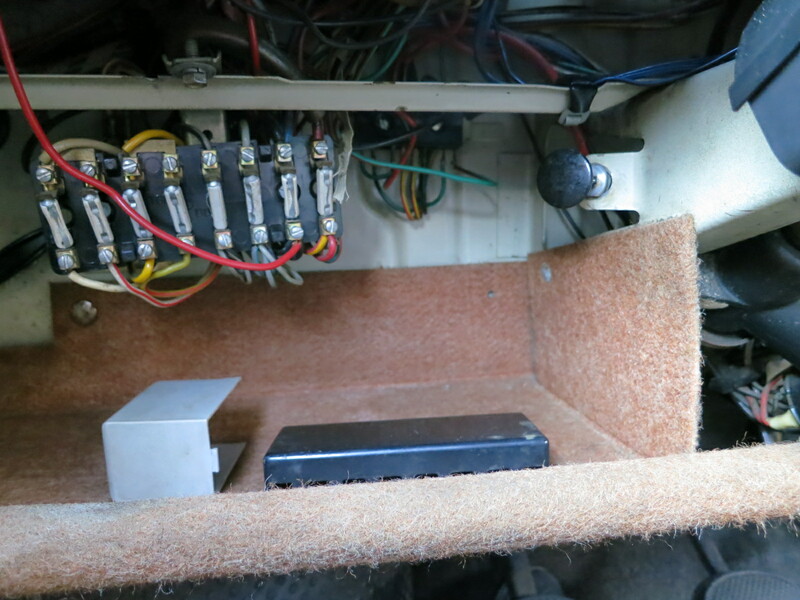 There’s no glove compartment. Just a shelf with fuses and stuff. The two-stroke engine made it smell like my old Vespa, but the closest experience was probably driving the 1937 Oliver tractor on my grandparents’ farm. 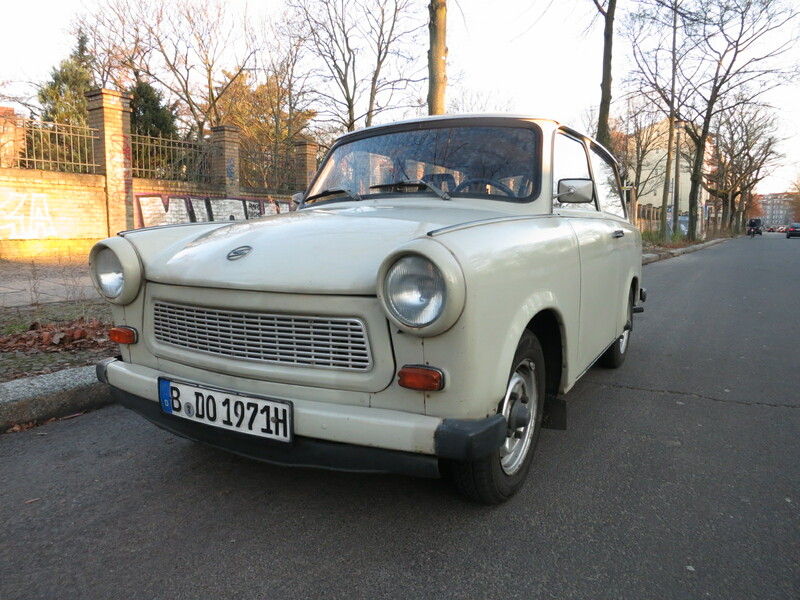 This entry was posted in Travel and tagged berlin, driving, germany, trabant on December 7, 2017 by mdw.